Recently, there has been an ongoing campaign to teach children how to code. In fact, England recently started including computer programming the national curriculum for primary and secondary schools. As software developers ourselves, we can’t be happier about this trend. Learning to code is critical in today’s world, where everything is moved forward by computers. It’s useful no matter what your kids want to do in the future as it equips them with creativity and problem-solving skills. If your family is not aboard the coding train yet, there are many resources out there to help you get started. A couple of years back we reviewed Move the Turtle, an excellent app for grade school-aged kids to learn to code using the Logo programming language. A more recent app is The Foos: Code for an Hour by developer codeSpark. It was created to support Hour of Code, a global initiative by CSEdWeek and Code.org to introduce computer programming to 100 million students worldwide. Fully visual, the app makes it simple for anyone to learn programming logic. The app contains 24 levels that span three worlds. Each world has a unique location and a number of programmable characters. For example, the first world is located in the city where the Police Foo keeps guard against the Glitch. 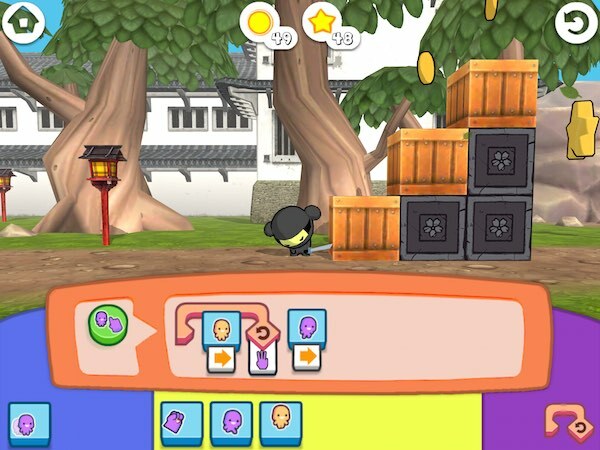 The goal in each level is to help the characters accomplish a task, such as collecting stars or capturing the Glitch. To do so you must create a sequence of actions, for example move once to the right and then jump once. These sequences are created by dragging and dropping the picture blocks from the bottom into your desired order. Then, tap on the Go button to run your sequence in realtime. You can modify your sequence as it runs. As the game progresses, the levels get more challenging and the program required gets more complex. More actions are introduced alongside new characters, and pretty soon you will learn to use parameters, loops, and conditional statements. You will also have to command more than one character to accomplish your goal. At the end of each level, the app will rank your effort using a three-star ranking system. The quicker you can finish a level, the more stars you collect. The stars can then be used to unlock the Toy Box in each world. These Toy Box areas allow you to experiment with complex commands as you control the characters any way you like. The Foos: Code for an Hour helps the players visualize abstract programming concepts. It doesn’t require you to write any code, and is simple enough for anyone to pick up and play. Parents who have no prior experience of programming should not worry about accompanying their kids as the gameplay is easy to grasp. In fact, it is recommended that parents and teachers finish the game first before introducing it to their kids. Teachers can download the free curriculum on the developer’s website. Once you have gone through all 24 levels with your child, you can get a certificate for completing the Hour of Code. You can tap on the secured link to access the developer’s website, where you can add your child’s name to the certificate and print it. The app is available for free on iOS as well as Mac OS X. It does not contain ads and in-app purchases. 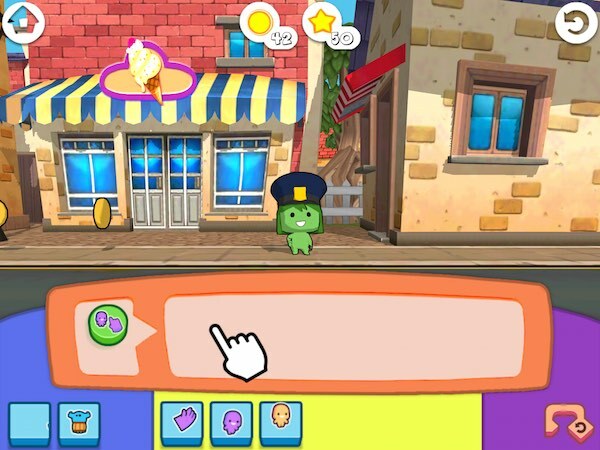 The app is designed to teach kids about problem solving and a sequential way of thinking. The required program gets more complex as the game progresses, and as such it’s likely that players will make mistakes. But, through these mistakes they’ll learn to debug their code and come up with an acceptable solution. The three-star ranking system is also valuable for encouraging kids to continually evaluate their program so they can make it more efficient. One thing to remember is that the app is not an all-encompassing guide to programming by all means. Your kids won’t be an expert coder by the end of the session, but hopefully they’ll be a little more excited to explore programming and Computer Science. 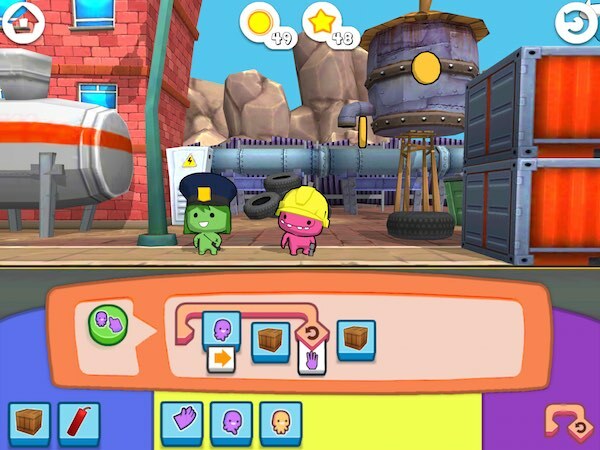 The Foos: Code for an Hour is a kid-friendly way to learn about computer programming. Completely language-neutral, it lets kids program cartoon characters by dragging and dropping picture blocks. Kids will learn to use creativity and problem-solving skills, as well as valuable coding concepts such as sequencing, commands and parameters, loops, and conditional statements. Suitable for kids as young as five years old.